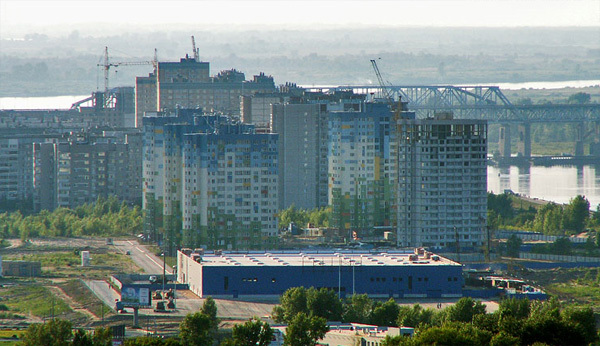 The group of companies «Stolitza Nizhniy» is performing the construction of the residential estate «Sedmoe nebo» located in the district Mesherskoe Ozero (Volzhskaya Naberezhnaya, Betankur, Karl Marks streets). The total area of the land riped for development amounts to 50 ha. For the construction of this residential estate the Group of Companies has chosen one of the picturesque places in the city. The famous Nizhniy Novgorod Fair took place there. Nearby there also another historic building is situated — the Alexander Nevskiy Cathedral. It is commanded a good view from the windows of the residential estate: the Kremlin, the Volga shore, Lake Mesherskoe, etc. One of the main advantages of this project is its location. It is situated not only in the picturesque but in the environmentally pristine place, far from the industrial establishments and in the centre of Nizhniy Novgorod at the same time. Good road interchange allows to get to any district of the city in 30 minutes. It is also prescribed the construction of the metropolitan station and the establishment of new bus routes in the near future.